I’m already very excited about the upcoming international Braids conference—Braids 2016. It’s finally seeming very imminent after three years of waiting…Robyn Spady and Giovanna Imperia (who took on organizing it this time) have announced that it’s all set, and we can mark our calendars. Even though the conference isn’t until the last week of July, 2016, with only about 200 total spaces available it’s probably a good idea to sign up early. * I’ll probably post more about the conference later on, but for now I just want to post a little about the class I’ll be teaching. It’s a 2-day workshop, entitled Playing with patterns in loop braiding. 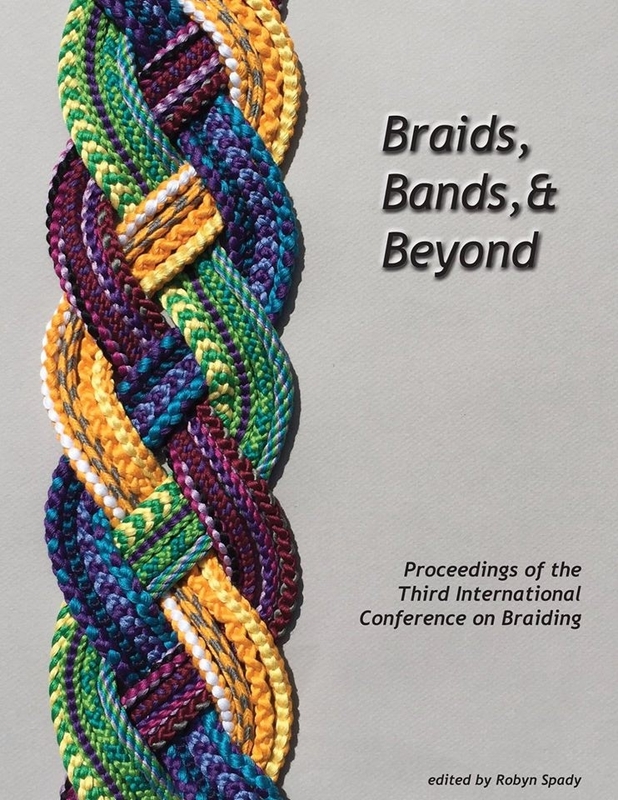 [the last two days of the conference – Thu and Fri.] It’s not a beginning level loop braiding class, but all the prerequisite braids can be learned from my free tutorials on this site. It’s all about braiding planned designs and motifs, rather than letting the thread colors and braiding moves create an ‘automatic’ pattern. On a smaller braid, but basically the same technique that was used in the 17th C. letter braids that I’ve posted about elsewhere on this blog. The braid I’ll be teaching in the workshop is the same type of braid as the Nun’s Book letterbraid, but a simpler version, having only eight loops rather than ten. This simpler version doesn’t require using thumbs to hold any of the loops. Although it has the same number of loops as an 8-loop double braid, it requires more braiding moves, and results in a braid with more ‘design space’ for patterns. It’s a great vehicle for learning how to braid simple motifs and designs, and possibly even how to chart out your own designs. Not letter-shapes—letters can’t quite fit into this 8-loop format, but many pretty designs and motifs are possible. The prerequisite braids for this class can all be learned from my free blog tutorials. However, if you are interested in this workshop, do start learning the prerequisite braids soon (well before the conference! )…Give yourself plenty of time—even for making the jump up from 5 to 7-loop square braids, before moving on to double braids. It usually takes some practice time to master the loop-shifting moves for 7-loop braids. And double braids have a completely different braiding procedure than square braids, so they require a bit of practice time as well. Once the moves for these braids are fairly automatic, you’ll be able to focus on the new patterning strategy rather than on the braiding moves. Prerequisite braids for my Pattern Play workshop are the ones in these tutorials: 7-loop square and flat braids, the bicolor loop tutorial, and the 8-loop version of my solid, flat, or hollow double braid tutorials. The divided (two-separate-layers) form of the 8-loop double braid would be especially helpful for learning the new braid in the workshop. In my videos I usually demo the divided form as a way to make a loop at the top of the braid, it doesn’t have its own tutorial. Familiarity with these braids—and in setting up and braiding them using bicolor loops—will be necessary for learning the simplified letterbraid. The Nun’s Letterbraid tutorial on this blog is not prerequisite for my my workshop. That tutorial teaches my solo-braider workaround method for braiding a ten-loop 17th C. braid having pickup patterning for forming the letters of the alphabet and other symbols. As with other braids of 10 loops or more, the letterbraids were traditionally braided by two braiders working together. One would braid the left half of the braid and the other the right half, while connecting the two halves after each row of braiding. 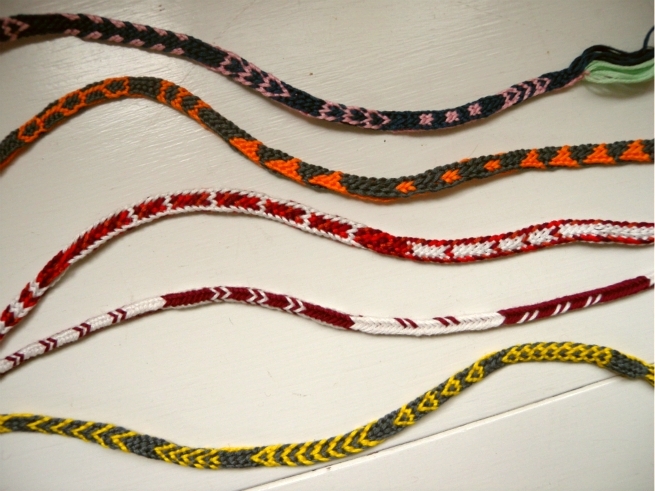 (The three known letterbraids’ methods of production were first described in 2009 by Joy Boutrup and Noemi Speiser, who resurrected the techniques from a few 17th C. documents). My Nun’s Letterbraid tutorial demos my solo-braider technique for making this braid, and how to follow Joy Boutrup’s charts for forming the various lettershapes. However, the tutorial doesn’t attempt to explain how and why the moves work, or how to create your own charted motifs. This is not at all obvious, as the chart for a motif only shows which loops to turn, it doesn’t resemble the motif itself (at least, not very much—as you get more used to the charts, you can start to vaguely recognize a semblance of the motif). My Braids 2016 class should bridge some of that gap, and make the process of creating charts for your own motifs more understandable, with a braid that is easier to make. Update: Here’s a link to the registration page on the Braid Society’s website. Apparently my class is now full, but there are still many great classes to choose from, including others that are low-tech, little-to-no-equipment techniques (I wish I could take all of these!) Some, maybe even half or more, require some previous experience with the technique. It’s a rare opportunity to expand your learning beyond beginning level with some of these techniques! As with my class, it is often possible to learn the prerequisites ahead of time for classes that require them. This will be the third of these international Braids conferences, but it’s the first time it’s being held in the U.S. The first one was held in Kyoto, Japan, 2007, and the second was in Manchester, England in 2012—I blogged about that one here. Dominic Taylor and Carol Wang will both be teaching different flavors of knotting, Rodrick Owen will be teaching Andean loop braids, Kim Davis will be teaching lacemaking with wire, Laverne Waddington will be teaching South American advanced weaving techniques, Carol James will be teaching Sprang and probably more, Makiko Tada — Japanese kumihimo master and originator of these Braids conferences — will be teaching kumihimo as will several other amazing teachers (Michael Hattori! )–several coming all the way from Japan, plus many more classes than my sleepy brain can remember at the moment—all the impressive band-weavers of backstrap, inkle and cards…A fun-looking bead-edged braid on an ultra-simple “bow loom” is being taught (from a traditional Thai technique)…oh, I think the organizers Robyn Spady and Giovanna Imperia are also teaching! The Braids 2016 facebook page is a better source for photos, it has bios and photos of several of the workshop teachers and topics. However, many of these don’t include links to their sites or galleries. It’s well worth googling teachers to find more of their work. July 23, 2015 in Original braids, Pick-up patterns. Quick question – do you or the organization have any plans for making this information available outside the conference? I’ve looked at Threads that Move and thought about buying it, but ultimately it’s more than I’m willing to pay for the two articles that interest me for an occasional hobby. If the sections were separated by technique or individual articles and available as a pdf, I’d be happy to throw money at it 🙂 i am veeeery interested in the color patterns you tease us with here, but attending the conference is not an option. What I will be teaching isn’t necessarily hard to learn, but it is very hard to explain in print or in a video. 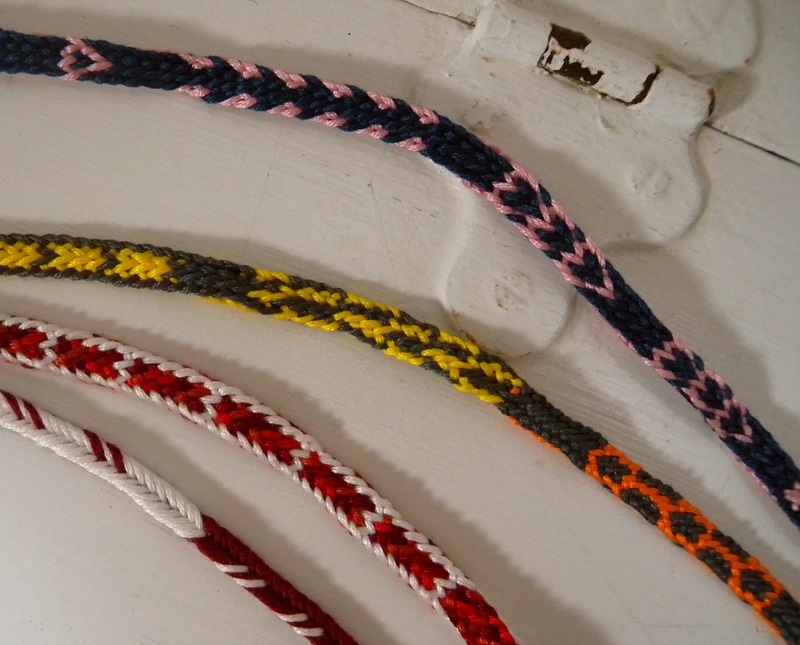 Pick-up patterning in loop braiding is much easier to teach in person than to describe. I don’t envision trying to teach it in the article I write for this year’s conference proceedings, or on my blog, beyond what I’ve already taught in my Nun’s Book tutorial. I’ve spent a lot of time making information available here on my blog that isn’t taught anywhere else, but I’ve also learned that some things can’t be taught in an online tutorial or a pdf file. Teaching at these Braids conferences isn’t profitable, btw! I’m paid for the class I teach, but still have to pay for my transportation, room and board, and participating in the rest of the conference, which adds up to much more than I’ll be paid. The Conference and the Braid Society are both non-profits, so they aren’t profiting from the conference either. It’s my understanding that any money made from fees (and from subsequent sales of the proceedings book) is spent on paying for the conference or helping fund the next one. oops – I forgot to answer your question about Threads That Move—these proceedings books are made mostly for the people who attend the conference (who get them as part of the conference), then apparently the leftovers are gradually sold off. The Braid Society might order a reprint if there’s a demand, or might not, but I doubt there’s anyone even available to do any work on it after the conference, it’s sort of “over and done with”. Thanks for responding. Not what I was hoping to hear :p but I do appreciate the response! Sorry, Jenifer… And I’m sorry I won’t get to meet you at Braids 2016, too! I will keep in mind what you said about being interested in purchasing a pdf, I’m not sure I’m allowed to make one from my past contribution to a conference’s proceedings book but I’ll look into it. Hi Caroline! I hope so too, thanks for the note!